When Felix Fischer of the U.S. Department of Energy's Lawrence Berkeley National Laboratory (Berkeley Lab) set out to develop nanostructures made of graphene using a new, controlled approach to chemical reactions, the first result was a surprise: spectacular images of individual carbon atoms and the bonds between them. "We weren't thinking about making beautiful images; the reactions themselves were the goal," says Fischer, a staff scientist in Berkeley Lab's Materials Sciences Division (MSD) and a professor of chemistry at the University of California, Berkeley. "But to really see what was happening at the single-atom level we had to use a uniquely sensitive atomic force microscope in Michael Crommie's laboratory." Crommie is an MSD scientist and a professor of physics at UC Berkeley. What the microscope showed the researchers, says Fischer, "was amazing." The specific outcomes of the reaction were themselves unexpected, but the visual evidence was even more so. 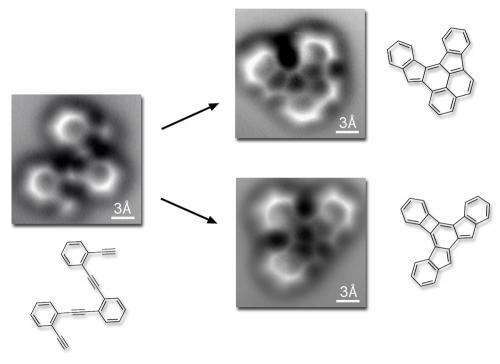 "Nobody has ever taken direct, single-bond-resolved images of individual molecules, right before and immediately after a complex organic reaction," Fischer says. The researchers report their results in the June 7, 2013 edition of the journal Science, available in advance on Science Express. Graphene nanostructures can form the transistors, logic gates, and other elements of exquisitely tiny electronic devices, but to become practical they will have to be mass produced with atomic precision. Hit-or-miss, top-down techniques, such as exfoliating graphite or unzipping carbon nanotubes, can't do the job. Fischer and his colleagues set out to engineer graphene nanostructures from the bottom up, by converting linear chains of carbon atoms into extended hexagonal sheets (polyaromatic hydrocarbons), using a reaction originally discovered by UC Berkeley professor Robert Bergman. The first requirement was to perform the reactions under controlled conditions. "In solution, more than a dozen compounds could be the products of the reaction we were using, and characterizing the results would be difficult," Fischer says. "Instead of a 3D solution we created a 2D system. We put our starting molecule" – a structure called oligo-enediyne, composed of three benzene rings linked by carbon atoms – "on a silver surface, and then induced reactions by heating it." Fischer's group collaborated with microscopy expert Crommie to devise the best possible view. The first attempt to track the reactions used a scanning tunneling microscope (STM), which senses electronic states when brought within a few billionths of a meter (nanometers) of the surface of the sample. But the image resolution of the tiny molecule and its products – each only about one nanometer across – wasn't good enough to reliably identify the molecular structures. The collaborators then turned to a technique called noncontact atomic force microscopy (nc-AFM), which probes the surface with a sharp tip. The tip is mechanically deflected by electronic forces very close to the sample, moving like a phonograph needle in a groove. 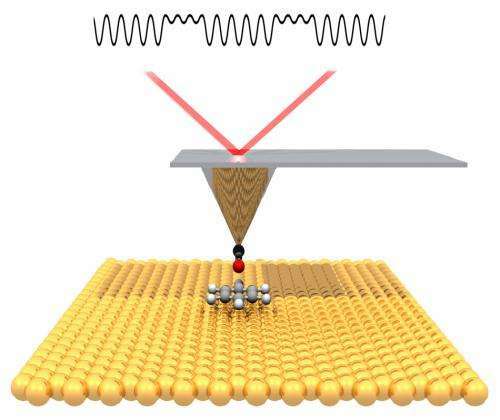 "A carbon monoxide molecule adsorbed onto the tip of the AFM 'needle' leaves a single oxygen atom as the probe," Fischer explains. "Moving this 'atomic finger' back and forth over the silver surface is like reading Braille, as if we were feeling the small atomic-scale bumps made by the atoms." Fischer notes that high-resolution AFM imaging was first performed by Gerhard Meyer's group at IBM Zurich, "but here we are using it to understand the results of a fundamental chemical reaction." The single-atom moving finger of the nc-AFM could feel not only the individual atoms but the forces representing the bonds formed by the electrons shared between them. The resulting images bore a startling resemblance to diagrams from a textbook or on the blackboard, used to teach chemistry, except here no imagination is required. Says Fischer, "What you see is what you have – the effects of the electron forces among the atoms, and even the bond order. You can distinguish single, double, and triple bonds." A chemical bond is not as simple a concept as it may appear, however. From the dozens of possibilities, the starting molecule's reaction did not yield what had intuitively seemed to Fischer and his colleagues the most likely products. Instead, the reaction produced two different molecules. The flat silver surface had rendered the reaction visible but also shaped it in unexpected ways. The nc-AFM microscopy provided striking visual confirmation of the mechanisms that underlie these synthetic organic chemical reactions, and the unexpected results reinforced the promise of this powerful new method for building advanced nanoscale electronic devices from the bottom up. Before much more complex graphitic nanostructures can result from this unique approach, says Fischer, "Large discoveries lie ahead." More information: "Direct Imaging of Covalent Bond Structure in Single-Molecule Chemical Reactions," by Dimas G. de Oteyza et al. Science Express, 2013. It's the first triple carbon bond imagined. It's apparently very short and thick at the same moment. There's something about looking at pictures of molecules that is almost... spooky. It's hard to pin point the exact feeling they inspire but it's as if we are witnessing a world we are not supposed to see. These images are simply astounding. I've spent my fair share of time trying to image specific tissues of plants using confocal (http://www.yorku....ile.html , some examples) and that was hard enough! It's humbling really, when you observe the use of a microscope by a master microscopist. In my lifetime, and I'm not yet 50! Merely seeing super strong flat polycyclics mated to crystal surfaces never excited me like these bowls and tinkertoys do. When you spend long hours for years at a time delving into organic synthesis, you make some very tiny friends, and their creative personalities can outwit and delight you, but you are flying blind a bit, squiggly plots on a printout. I've got some helicene samples around here somewhere, sparkling ruby red, just begging to appear on their microscope stage. Amazing but missing something. Molecules aren't 2 dimensional. From any other plane these molecules would simply look like a line. Moebius, the double bonded carbons and six member rings are aromatic, hence they are flat (Pointed out by NikFromNYC). The thickness is measurable by AFM, but best in contact mode. This is not contact mode, and besides, at a 3 angstrom scale, the imagine talent of the microscopist is amazing! I was pretty good at AFM, but better at Confocal and SEM. On another note, within academia this is useful in that we now know because "seeing is believing" adding much credit to those before us that have laid the foundation for molecular modelling, and that we now see that Organic Chemistry class is not a waste of time! It wouldn't - the seemingly planar molecules of polyarylenes are deformed and bent due the tension of electrons and attractive delocalization forces of pi-orbitals. 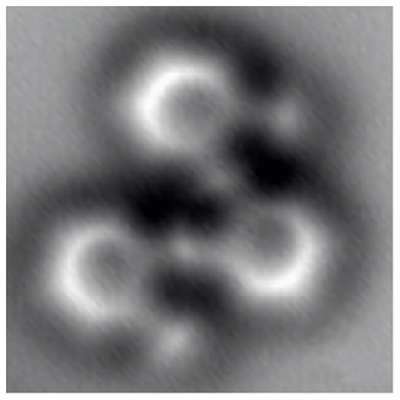 Which is clearly visible at the above AFM image after all - the hexagons at the borders of molecules are deformed with perspective and lighter than their interior. The AF microscopy provides more informations than you may think, if you know, where to look at it. Amazing. So here it is, plainly visible after all these years. It's amazing that people were able to figure out these structures without see them, even over 100 years ago. So is the brightness of the outside of the rings because of how close, relatively, they are to the probe, or is that showing us the density of the electron probability field in the bond? We can clearly see the way the pi character of two out of three bonds on the outside spreads out across all three, which is cool. But what I wonder about is the middle bond on the outside of the rings looks brighter. Is that the shape of the molecule, my eyes tricking me, or is the pi character of that middle bond actually slightly more intense than the two bonds around it? Or is it bond length that tells the tale instead of shininess? Is shininess just shape where bond length tells the real tale? I don't think I'm phrasing my question very well. Is it just my eyes or does the middle of that shiny "crescent" on the outside of the rings look a bit brighter than the ends? And if so, why? The AMF image isn't sensitive to electron density like the STM. As I explained above, the thicker borders are more close to scanning tip, because the whole molecule is deformed and bent like the leaf floating at the water surface. This one brought me back to Physorg. Mind equals blown. It looks just like a molecular skeletal diagram! Is this some trick or manipulation, that the proportions of the bond lengths and the size of the molecules are just as they are in diagrams? This is about Islamic pattern design. Which is probably just a reminder that it was well known that angular aspects of combinations of geometry, and tying that to frequency...that this was well known as the fundamentals of the universe...known...thousands of years ago. This discovery is not just 'proving' organic chemistry, but proving it's alchemical and gnostic, and even far earlier origins from thousands of years back. Nothing new under the sun --if you bother to look, or understand that you should be looking and knowing the origins of all this..